When my children were at home their eyes would grow large with the lifting of each box lid – hands extended they wanted to put the most decorations on the tree. Was it bad that after they went to bed I would rearrange several (alright most) of those? We have been using the same angel to top our tree for as long as we can remember. I found her at a garage sale years ago. 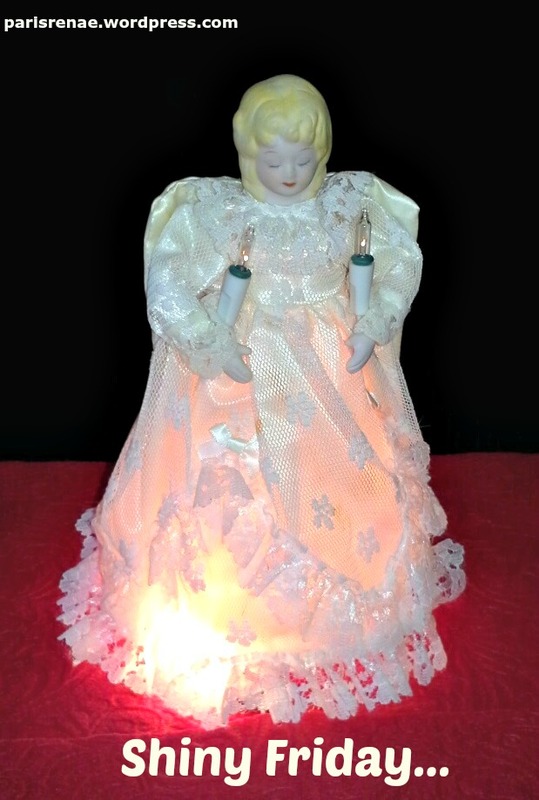 She holds a light in each hand, and underneath her skirt is a little ring of lights. Last year she didn’t light up – oh no… I put her up anyway and pouted for a while. Sounds so very similar to my Friday after Thanksgiving day. Forget the shopping and start the memories! The simple pleasures of rememberances are what draws us to the most wonderful gift ~ Our Savior! So cool! And how special! That is my favorite day after Thanksgiving as well. As a matter of fact we just finished getting all the Christmas boxes down. Aren’t husbands wonderful, with their little surprises for us!